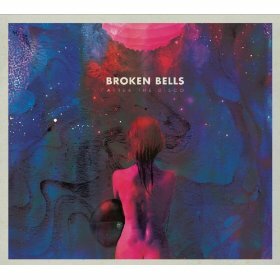 Indie rockers Broken Bells are back with their second full-length album, After the Disco, but not much has changed from the collaborative duo; Producer Brian Burton, aka Danger Mouse, and The Shins’ lead vocalist and guitarist James Mercer showcase their mature, cohesive indie-wave sound. Unfortunately, James Mercer left his longtime band The Shins shortly after the release of After the Disco and ironically enough, a year after one of the band’s most successful albums, Port of Morrow. “Perfect World” sums up Mercer’s fairwell tribute to The Shins “We look to exit signs/But we can’t be changed into/Nothing over night/Though we know its over/It keeps exploding.” Mercer turns a new page and the result is After the Disco. “After the Disco” is a groovy throwback track with cool, indie-electro, hypnotic beats that synchronize perfectly over Mercer’s vocals. It’s speedy pickup keeps us enticed with non-vocal instrumental breakthroughs. Each song consistenly connects perfectly like a chapter book. “Holding On for Life” sounds like zombies shrieking, which is most likely heard in the climax scene of a horror film, but thankfully we are reassured by soft, soothing vocals and lovey-dovey lyrics. Mercer extends his vocals outside of the falsetto range. We’d love to hear more of that young Michael Jackson style.